Do not spill or splash brake fluid on painted surfaces. Brake fluid may damage paint. If brake fluid is splashed on painted areas, wash it away with water immediately. Do not scratch the piston of master cylinder when installing/removing because the piston is exposed. Check for any dust on the piston, and wash with brake fluid if needed. Hold the master cylinder body when handing the master cylinder assembly. Do not hold the piston because the piston might become detached if pulled strongly. Refill the reservoir tank with new brake fluid вЂњDOT 3вЂќ. Do not reuse master cylinder O-ring. Partially drain brake fluid. Refer to BR-17, "Drain and Refill". Disconnect the harness connector from the brake fluid level switch. Remove air duct and air cleaner case. Refer to EM-25, "Removal and Installation". Remove the engine room insulator and position aside. Separate the brake tube from master cylinder assembly with a suitable tool. Do not scratch the flare nut and the brake tube. Disconnect the clutch hose (if equipped). Remove the master cylinder assembly. Do not deform or bend the brake tubes. 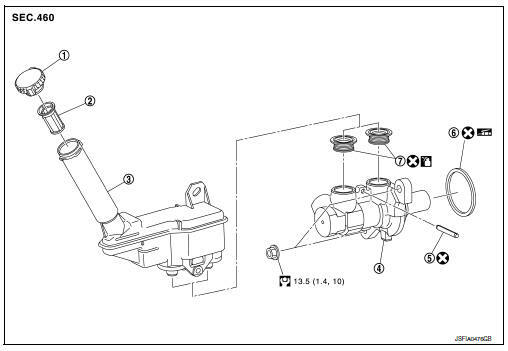 Do not depress the brake pedal after the master cylinder assembly is removed. The piston of the master cylinder assembly is exposed. Do not damage the piston when removing the master cylinder. The piston may drop off when pulled out strongly. Do not hold the piston. Hold the cylinder body when handling the master cylinder assembly. Apply PBC (Poly Butyl Cuprysil) grease or equivalent to the brake booster (A) when installing the master cylinder assembly to the brake booster. Temporarily tighten the brake tube flare nut to the master cylinder assembly by hand. Then tighten it to the specified torque.Refer to BR-25, "FRONT : Exploded View". Perform the air bleeding. Refer to BR-17, "Bleeding Brake System".